Caramelized onions are the way to my heart. And caramelized onions + peppers??? Now that is definitely the way to my heart. Or an added little bonus, if you will. And man am I excited to share this recipe with you today. Actually, if I didn’t have the attention span of a five year old sometimes, you would have gotten this one even sooner. You see, this recipe was an attempt to recreate a dish that my grandma always used to make. She made these absolutely killer slow cooked onions and peppers, which she cooked for hours upon hours in this enormous electric skillet that probably weighed more than she did. And to these awesome onions and peppers she would then add some scrambled eggs. She would make a huge batch and send them back with me to college or in later years back to my job in DC. And I would proceed to eat them all in 2.5 seconds. So much for pacing myself. We talked about all this when I was in New Jersey for Christmas and then again when I went to visit her for a week in January. Like extensively talked about it – how exactly she made them and how good they were and I even vowed to try making them as soon as I got home. And then that obviously failed to happen. I was all ooooo jalapeno soft pretzels and oh my gosh I need to make some eggplant rollatini. And even all about bananas (which I can’t even stand raw). I told you – limited attention span. Or maybe I’ll just go with super passionate, excited about food and there’s just too much good stuff to eat all the time. Anyway, the recipe is finally here. Cue the angels singing! Trumpets sounding! So instead of doing this in a skillet like my grandma, I decided to turn to my trusty slow cooker to get the job done. I use it all the time for my crockpot french onion soup, where the base is made up of caramelized onions. 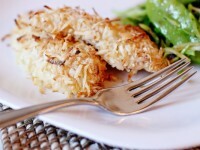 So pretty much the same method is used in this recipe here today. I’ve made a few tweaks but otherwise the process is the same. Just no soup (obviously). I say this in the french onion soup post and I’ll say it again here. This is not a totally hands-off method. You do need to be around to stir the onions and peppers every so often (about every 45 minutes). But I do promise that the end result is absolutely worth it. Buttery and packed full of flavor. 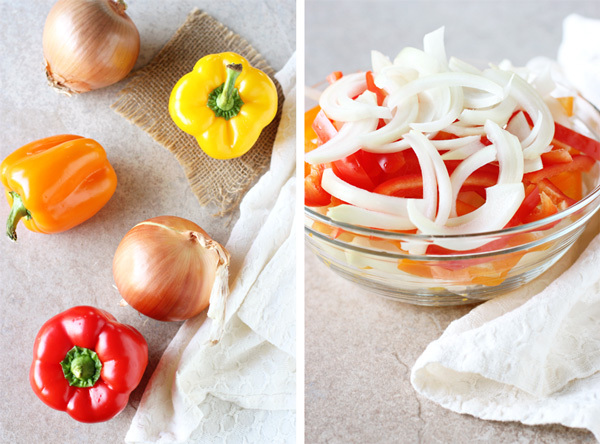 You’re gonna want to eat these onions and peppers straight out of the crockpot with a spoon. My favorite way to enjoy them is stirred into some scrambled eggs. Just like my grandma made. But with some avocado toast on the side. Ooo ooo and a big cup of coffee. 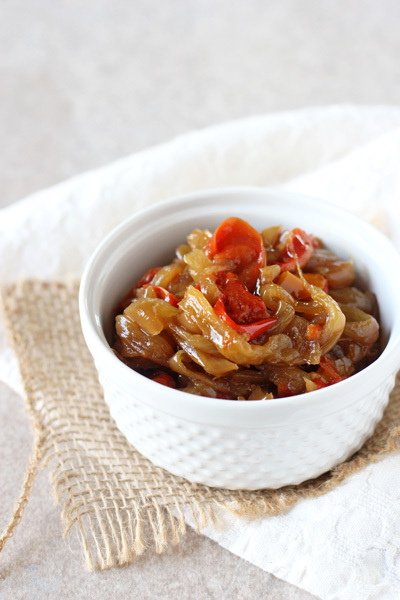 Let your crockpot do all the work with this recipe for slow cooker caramelized onions and peppers! Buttery and full of flavor. Add the onions and peppers to your crockpot, then drizzle with the butter and sprinkle with the salt. Toss to combine. Turn on your crockpot to high, cover and let cook for 1 hour. After the first hour, give the mixture a good stir. Place a double layer of paper towels under the lid (which will help to absorb some of the released moisture – you’ll want to replace this layer about 2 to 3 times during the cooking process). Continue to cook on high for about 5 to 6 additional hours, stirring about every 40 to 45 minutes. You want the onions to be a caramel color and the peppers to be nice and tender and so soft. Toward the end of the cooking time, keep a closer eye on the crockpot (you don’t want to let the onions / peppers burn and may need to stir them more often). Discard the paper towels. 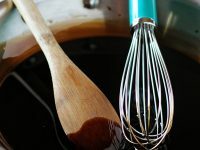 Serve however you would like, scooping them out with a slotted spoon to get rid of any excess liquid in the crockpot. My biggest piece of advice here – know your slow cooker. They all cook slightly different and have slightly different heat levels. After making the onions and peppers like this a few times, I know how often I need to stir and exactly how long it takes. You also want to slice everything about the same size – so that they all cook evenly. I slice my onions and peppers about a touch more than ¼ inch thick. You could also use green peppers or really any color combo of peppers you would like! Oh yum! There is so much that you can do with caramelized peppers and onions and these looks delicious! This does sound amazing – and perfect for so many things! I think I’d love a grilled chicken sandwich piled high with these…thanks to your Grandma for sharing her secrets, and I love the slow cooker twist! I would be all over this!! I love family recipes – they make even delicious things like caramelized onions + peppers taste even better! Agreed! They make it feel even more special! what a great trick! looks delish. You literally just made my mouth water with seeing them in scrambled eggs! YUM! I am so hungry now! I’m seriously going to the kitchen to make something similar! They are so good together! Thanks Kristi! So much easier!! Thanks Katy! I love, love, love me some caramelized onions – what a BRILLIANT idea this is to make them with peppers in a slow cooker! I could eat this by the spoonful! Love that you made these in the slow cooker, Ashley! What a fantastic idea! This is totally calling my name. I think I could eat these plain or pop them into just about anything! Pinned! Great idea to stir these into some scrambled eggs! My hubby would love this! I just love that you got this recipe from your grandma, Ashley. Obviously this is a really well tried and tested recipe – I love that, too! 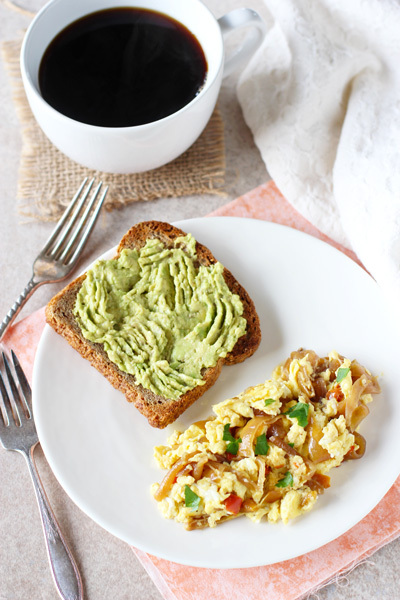 I really wish you lived near to me so you could pop over and make me this breakfast … avocado toast and all! Aww yea, a grandma inspired recipe! On another note, this post got me in the mood for French onion soup…. Hmmm, maybe for dinner tonight I’ll make some?! That sounds like a fantastic plan! 🙂 Happy weekend! I love a versatile dish like this, it can be added to so many things or eaten alone straight from the pot! Also love the fact you altered it for a slow cooker………. I love my slow cooker!!! Thanks Emma! I love mine too! Oh gosh me too – this way you still have to stir but wayyyyy less often! You are not alone, I get sidetracked all the time amidst posting things for holidays, etc. I hate that! It’s the day to day stuff that’s more important, and these sound really special. It’s a recipe from your grandmother so it has to be, right? I love the sound of doing this in the crock pot — I would find so many uses for this! I think those look like the most perfect scrambled eggs ever! Those veggies look amazing, I will definitely be trying this recipe soon. And I love that you used the slow cooker, I definitely prefer that option whenever possible! Pinned! Mmm…buttery caramelized onion are the best! 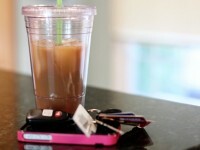 I love that you can multitask while you make them too. Now I’m craving that whole combination- minus the coffee 😉 – for breakfast tomorrow! Yum!!! I never have the time to make GOOD caramelized onions on the stove. This is the perfect solution! Now I feel like having a sandwich with avocado omomomomom!! These caramelised veggies look delicious – I really adore caramelised onion! Need to give the recipe a go soon, they would also be so amazing tossed into some pasta in Italian tomato sauce! Yum, thanks for sharing Ashley! Yes! They would be awesomeeee in pasta! Thanks Jess! 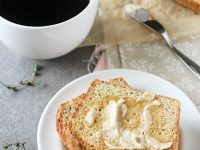 (Don’t think my first comment went through)…was just saying that this is such a treat to have around to put on anything but I love the idea of having it with scrambled eggs! I love anything with eggs. 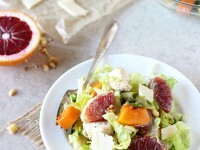 : ) I have to try this crock pot method! This is what I’m talkin’ about! Love recipes that can be used endlessly. This sounds like a recipe my husband would love. I can already picture him putting these caramelized onions on a sandwich or burger! 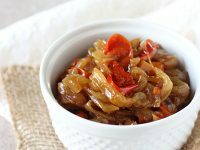 Caramelized onions are the best and the fact that you made them with peppers in the slow cooker is the way to my heart! They look incredible and I love that you added them to scrambled eggs just the way your grandma makes them for you:) So delicious!! Thanks Kelly! Have a great weekend!! Caramelised onions and peppers is my JAM!! Especially the onions, I may need to join a support group. Why have I never thought of mixing them into scrambled eggs?! They look phenomenal! And by phenomenal I mean when are coming over for breakfast?! What a fantastic idea to do this in the slow cooker. Genius, girlfriend! I love nostalgic recipes like this. All of my family recipes are super labor intensive (like homemade pierogies that take about 300 hours…). So I love that this is slow cooker, easy but delicious! haha oh gosh, I know what you mean! Thankfully my grandma’s recipes were all mostly slow cooked but nothing complicated!! Caramelized onions are the way to my heart too! 😀 These look just perfect and love the addition of peppers! I can just imagine this on a big bean burger or something. I love how caramelising onions really brings out the flavour of them.